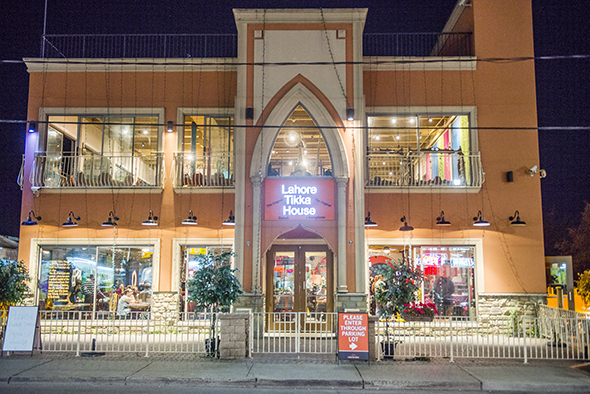 Lahore Tikka House might just be Toronto's most popular and palatial Northern Indian and Pakistani restaurant. It's freakin' huge with two floors and a patio, meaning at full capacity this place can hold hundreds. The decor is simpler downstairs and a little more ornate upstairs, but there's no special use for the upstairs other than overflow. 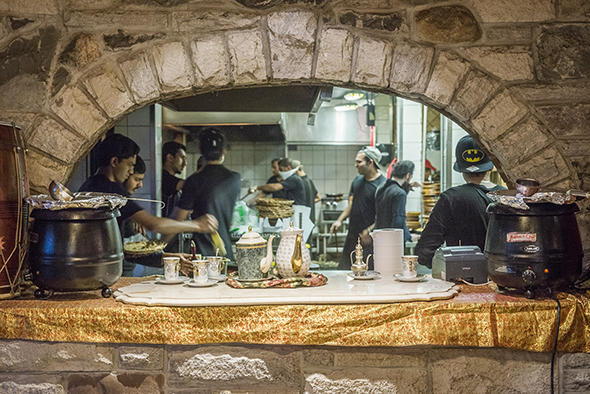 You can see into the kitchen through a little archway where they're constantly making naan in the tandoor. 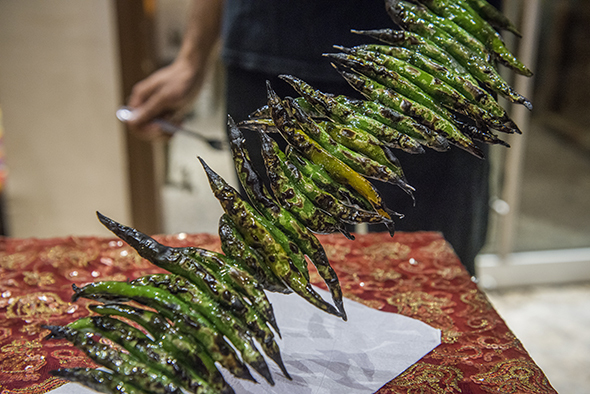 As you dine, servers hand out barbecued green chilis - take little bites, they're really spicy! 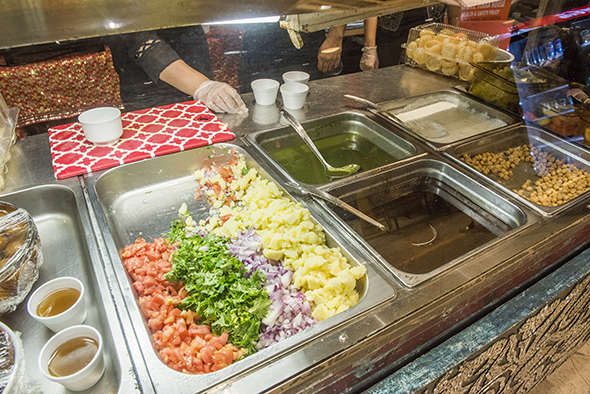 They also have a takeout counter that's combined with the pani puri station. The ordering system here involves instructions on the menu: you write your order on a white board, take it to the counter, get a number, then at the end you go back to the counter to pay. 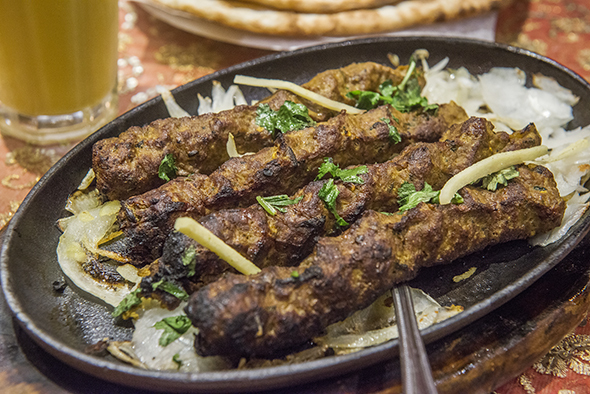 They're known for their fresh kebabs, and this beef ($2.99 per kebab) was cooked to order in the tandoor for optimal smokiness. They still do it old school, presented sizzling on a hot plate. The minced meat is seasoned with coriander, ginger, and garlic, and it's served with onions. Everything here is halal, and they don't even serve alcohol. Tap water is available on request. 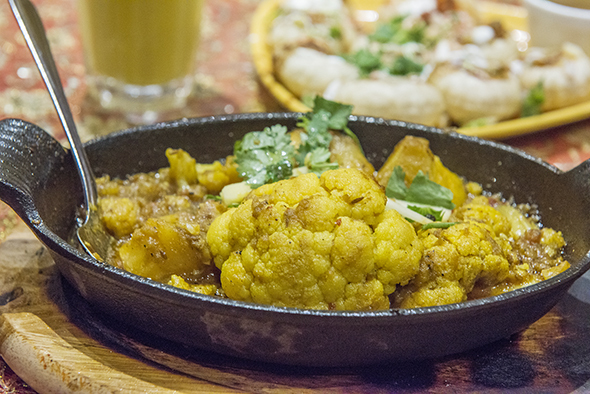 The aloo gobi ($12.99) is another special here, cauliflower and potatoes cooked in fresh onions, tomatoes and spices. 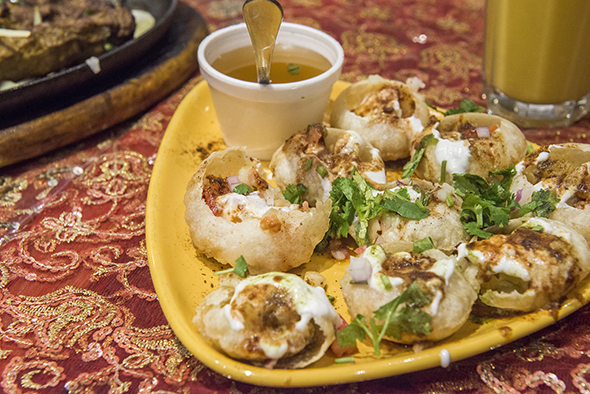 The pani puri is described to me as sort of like Pakistani nachos. The elements are there: crispy wheat wafers filled with chickpea and potato, with yogurt, tamarind chutney, and spices on top. Spoon masala water (pani) into the shells and eat each puri pastry all in one bite. 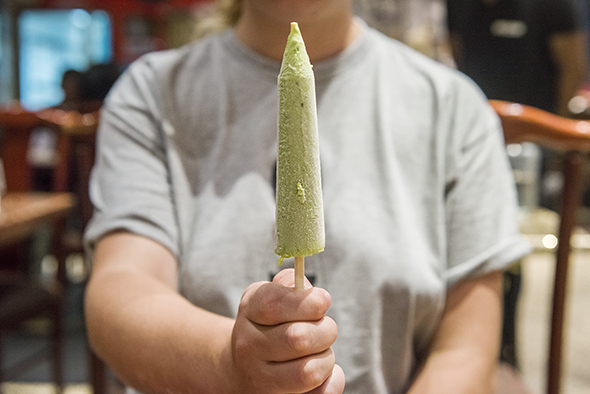 They're also known for their desserts, especially the kulfi ($2.99). It takes hours to make in house using the fat that boils off of milk. It comes in cardamom and almond, mango, and this pistachio flavour which is made with ground pistachios.